Everyone loves those soft delicious King’s Hawaiian rolls and now they have Hamburger and Hotdog buns. Print out this $1.00 off any TWO KING’S HAWAIIAN Buns or Rolls to score them for $1.98 at Walmart. 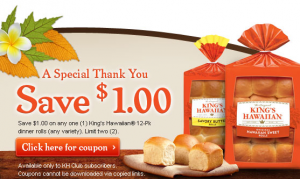 Print out this $1.00 off 2 King’s Hawaiian 12pk Dinner Rolls to score them for under $2. I have lots to say about this item but it is a carb and I don’t want to think about how soft and delicious they are. Anyway, I found this coupon on Page 3 if that helps.